You know mother is around when for the very first time in so many months, your laundry bin's been cleaned inside out. Your bed has a fresh change of linen. When you wake up in the morning, a breakfast of eggs, fried rice and a hot mug of coffee is waiting for you at the dinner table. The clothes you wear to the office actually look neatly pressed and your colleagues notice it. Best of all, there's a woman in the house you can hug and kiss! I was around five when I first fell in love. My very first day in grade school. I remember it oh so vividly: I didn’t want to go to school, at least not yet, preferring instead to spend my afternoons chasing dragonflies in the grassy lot behind our house. I had had my taste of kindergarten and didn’t quite get the hang of it. But Mama, who was a public school teacher, wanted to enroll me as a salingpusa in a colleague’s class; there I was – furiously wiping away tears with my hands as I stood behind my mother’s skirt and oblivious to her entreaties that things will be okay as soon as I meet my teacher- when she passed by. She seemed to float as she walked, this pretty girl who, from out of nowhere, entered my life at such an inopportune time. It was such a fleeting but heavenly moment; she threw a glance at me and and my tear-soaked gaze met hers; the embarrassed cry-baby in me smiled at her, and she smiled back, and then she went on her sweet, sweet way; I don’t remember now if at that time, she was with her mother. All I remember were her lovely round eyes and the dimples on her cheeks. Inexplicably, my heart beat like mad as my tender gaze followed her, until she disappeared in the noisy sea of students excited to attend their first day at the Lagao Central Elementary School. Right there and then, I decided that I was going to like school after all, and then–dutifully headed for Mrs. Tulio’s class. THESE DAYS, I feel that my life is bone-dry, empty of the excitement that always seems to grip the very depths of the lives of others. It is always the others who seem to bask in the rapture of high spiritual experience, never I. Yet I long for the experience of spiritual high, the fire of passion for God, a lasting glimpse of the Holy. I am tired of living by rote and long for a mountain-top experience, one that lasts a lifetime. But how? When evening falls on the drudgery of the everyday, I sometimes retreat to a small corner of my thoughts, where I can listen to some Bach or Rachmaninoff on my turntable, and, like the prophet Elijah feeling that he has reached the end of his rope, I simply wait for sleep to come. Man, I've been too busy to keep track of my flights of book-banditry in the last few months. Just the other day, I bought a fairly recent American edition of Grey's Anatomy (P225) and the feminist theologian Elisabeth Schussler Fiorenza's path-breaking work on feminist hermeneutics In Memory of Her: A Feminist Theological Reconstruction of Christian Origins (P115). There's also a collection of George Plimpton's anthology of sports essays On Sports (P120). (Plimpton, founding editor of the Paris Review, died a few months ago, didn't he?). Last Sunday, I made a big catch of bargain books at P20 each, including Pete Hamill's long essay on Journalism at the End of the 20th Century, A.J. Cronin's novel The Citadel, J.G. Ballard's short story collection War Fever, and an O. Henry Short Story Awards anthology for the year 1984. And I know I still have more books yet unaccounted for, including purchases made in Gensan over the Christmas holidays (surprise of surprises, the National Bookstore branch at the newly opened Robinson's Mall there had a treasure trove of bargain-books for the picking. Among other titles I found there a hardcover new edition Oxford English Bible for P200, which is a steal). I also see more and more back issues of Granta magazine surfacing in BookSale outlets. A good sign. They usually go for P75 but the newer editions are priced at between P115-P150. On the other hand, I hardly see back issues of Harper's and the New Yorker magazines in the stands these days. My friend Gilbert Tan alerted me to this: my post below was lifted in full and published on Page 120 of the commemorative book Cory Magic, which came out in December last year. It is pictured -- courtesy of my friend -- as it appears there. Only that contributors like me don't get to have a complimentary copy of the rather expensive tome! The amazing thing about all this is that it's totally spontaneous; it can't be, couldn't have been, orchestrated by a mad and hideous conspiracy. It has the moral clarity and historical certainty --the pure bliss -- of an impossible dream. 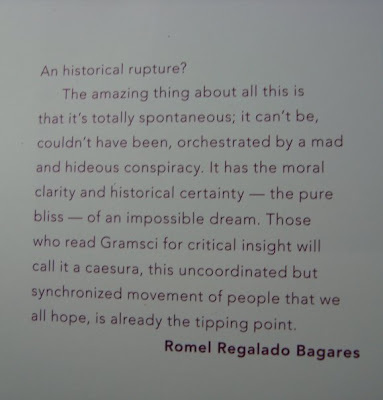 Those who read Gramsci for critical insight will call it a caesura, this uncoordinated but synchronized movement of people that we all hope, is already the tipping point. Newsbreak magazine has featured a statement we at the Center for International Law issued over the dire condition in makeshift camps of thousands of civilians displaced by renewed fighting in Central Mindanao between government forces and the separatist Moro Islamic Liberation Front. 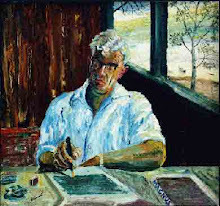 A disciple of Wittgenstein once wrote a book about the "danger of words" (the psychiatrist M. O'C Drury, 1996, Wittgenstein studies, Thoemmes Press). This illustrates the point, if in a hilarious and instructive way, as only the masters of the Queen's English can, on the life-changing issue of what makes potato chips click, and according to the demanding and weighty craft of legal interpretation. The Bridge Cafe, Groenburgwal, Amsterdam. Memories of my one-year Amsterdam sojourn. Whenever Nina Ferrer hears the roar of jets above her small hut in San Jose, Antique, she runs to the nearby beach to wave at the aircraft. Though she is no madwoman, Ferrer is stranded in an island of the past. Up there in the skies, she says, could be her son who, more than three decades ago, was taken away by her first husband. "How long ago was it?" she asked. "My son must be 35 now." As she spoke, Ferrer's face turned red with emotion. "I have cried so many times over my baby, how I want to know where he is now, whether he now has a family of his own. I just want to see him before I die." Ferrer lost her son Virgilio in 1966 to her American husband who took the then two-year-old boy to the United States and never came back. The last thing she heard was Virgilio had been jailed in the US for unclear reasons, and that he did not want to see his mother or know anything about her. But Ferrer's friend, Ting Elvas, consoles her. "God is not deaf that He should not hear your cries," she tells her. "We will see your son soon." All her life Ferrer has been singing sad songs. She lost her mother at a tender age and, being the youngest of six siblings, was given away to an aunt who resolved to turn her into a teacher. Ferrer, however, had a different dream for herself. She wanted to be a famous singer like her idol Janet McDonald, the American who played a beautiful Indian maiden in the movie The Indian Love Call. She still remembers every detail of that movie, particularly its theme song which she hasn't sung in years: "When I'm calling you, will you answer too... You belong to me and I belong to you." Ferrer pursued her dream by joining, in 1959, a televised singing contest in Manila. She did not win, but was hired by the host to be part of the staff. One day in the early 1960s, she was invited by a friend to Olongapo to meet lonely American sailors looking for female company. There she met a handsome serviceman, Herbert Waine Gill from Long Beach, California. They fell in love and soon got married. But the marriage never produced children. Gill, as Ferrer later discovered, was impotent. While married to Gill, Ferrer met a Filipino mestizo in the US Navy with whom she had an affair. The relationship bore her a child, a boy she christened Virgilio Luisito. Though Gill knew that the boy was not his son, he still liked him for looking very American with his brown hair and fair skin. He treated him as if he were his own child, and Ferrer thought everything would work out fine. But she was mistaken. One day in 1966, when the boy was two years and six months old, Ferrer came home to an empty apartment. The place was in shambles, and her son was nowhere to be found. "My husband was obviously in a hurry to leave. 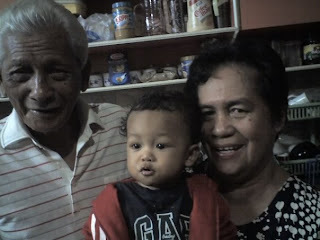 He brought with him everything, including our family pictures and Virgilio's baptismal certificate," she recalled. Gill also took her US green card and their marriage certificate. Ferrer received a letter from Gill several weeks later, announcing that Virgilio had survived the trip to the US. She got another letter several years later which informed her that the boy was growing up fast and that he had been enrolled in a Catholic school. Distraught, Ferrer returned to her hometown in 1974 and got married to a shipping company employee, Abelardo Guillermo. A year later, she and her new husband had a son whom she named Abraham Joy. "I named him Abraham after the great patriarch of the Bible who had longed for a son for so long until God blessed him and made him a father of many nations," she said. "I also named him Joy because somehow he eased the terrible pain within me." Abraham Joy is now 24 and a third year business student in Sibalom town in Antique. Mother and son live in a small hut at the corner of a beach resort owned by one of Ferrer's nephews. Although her second son is a source of happiness, still Ferrer longs for the company of her first "baby." Ferrer said she cried in disbelief when she read a letter from the Bureau of Naval Personnel in Washington DC telling her that her son was in prison and "has no desire to see, hear or write his biological mother." The letter was in response to a query Ferrer made in July 1997, asking US navy authorities if her son was in the naval service. How she got to send the inquiry is a story in itself. Sometime in 1992, as US troops were pulling out of Clark Field, an American serviceman came to Iloilo looking for Ferrer. The man said he was helping his colleague look for his mother. His colleague's name was Louis Wayne Gill. Ferrer learned about the American only a year later. When she looked for him, the serviceman was already gone. "So near and yet so far," she sighed. Ferrer then wrote the US Navy and asked about her son. But according to Navy officials, no Louis Wayne Gill ever entered the service. The officials, however, said they had located Herbert Waine Gill, Ferrer's former husband, and that he had told them that he had divorced her for "adultery and voluntary abandonment" in 1967. The US Navy's inconstant reply to her queries only sharpened Ferrer's feeling of loss. Now 62, she is a widow and lives through the meager pension of her late husband and the earnings of a small sari-sari (variety) store. She says she is looking for her son not to ask for anything. "I am not interested in money or anything. I just want to see him again before I die," she said. "I am not losing hope." I first heard their music in a humanities class at UP. One or two of them ( I don't remember anymore) happened to be in the same class as I was. The professor was the wife of their very first manager. The man played for the sole pleasure of the class a demonstration tape (CDs were largely unknown in those analog days) of what would soon be their first big hit --"Pare Ko". 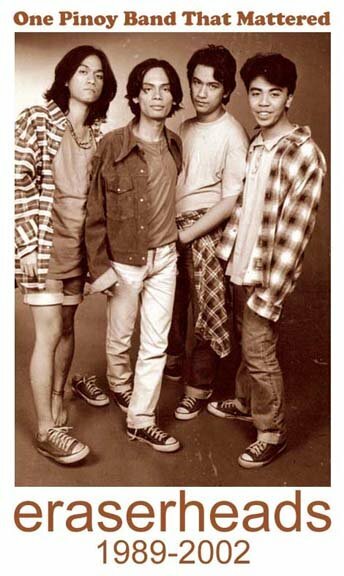 Back then, I was a promdi who didn't know a thing about urban popular culture and who couldn't care any less about a band of virtual unknowns called the Eraserheads. "Ugh," I muttered to myself, "how vulgar could a song get!" I now hazard to say members of that humanities class were most probably among the very first ones to hear the song just before it was released in the market. But it went on to conquer the Philippine music world by storm, heralding a new gilded age for Filipino youth bands and earning for the Eraserheads the monicker the Philippines' Fab Four. And it didn't even matter to me that one of them also stayed (or squatted) in the same dormitory as I did, the venerable Narra Residence Hall. Some mornings, I'd run into him in the hallway as I headed for my wing's common showerstalls. Often, he'd have a girlfriend's tight embrace as he made his way to the canteen. The Eraserheads was just one of the many bands that made Narra a venue for their jamming sessions. It was the height of Narra's infamous free-wheeling decadence (a contemporary act that also made a name in the local music scene was Yano, whose members also proudly called Narra their home sweet home). At Narra, the Eraserheads existed happily with a professor named Bading Carlos, pre-final examination week X-rated expositions, open house celebrations that featured a raffle where the top prize was a night in the company of a prostitute, fraternity rumbles, pot sessions, drinking binges, among many other adolescent excesses. Looking back, I couldn't believe I survived the Eraserheads and all that!